Isolation processing is an important shaping activity. 90% of the leaders Dr. Clinton has studied experience the shaping activity of isolation. 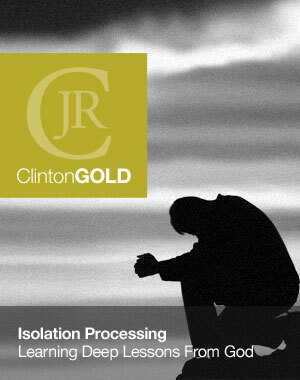 Dr. Clinton begins this paper by defining and describing isolation. What is isolation? Isolation processing refers to the setting aside of a leader from normal ministry or leadership involvement due to involuntary causes, partially self-caused or voluntary causes for a period of time sufficient enough to cause and/or allow serious evaluation of life and ministry. Isolation can be categorized into three major types: Type I. Negative Sovereign Intervention; Type II. Negative Opposition; Type III. Positive Self-Choice. Dr. Clinton next suggests some results of isolation processing and gives some common happenings - of all three types. And then comes the heart of the paper. Dr. Clinton describes four Biblical leaders (Job, Moses, Elijah and Paul) who went through isolation. He points out their responses to it and the lessons learned. A proper response to this shaping activity will see a leader examine what God is longing to teach him/her and proactively respond to God's shaping.